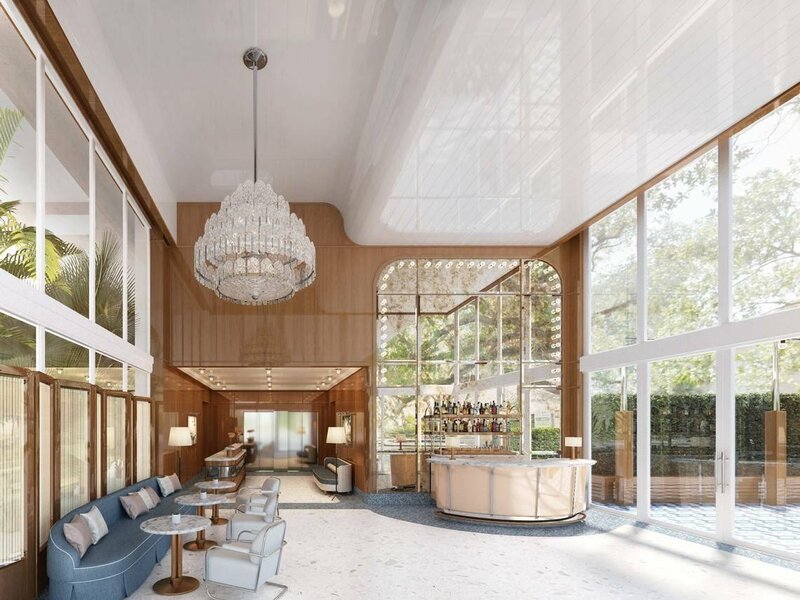 Suspended on stilts over the transforming Coconut Grove will soon be a new hotel addition to the neighborhood — with a familiar name. The Ciprianis are coming to the Grove. The prominent Italian hospitality family plans to open its newest property, Mr. C Coconut Grove, this winter. Located at 2988 McFarlane Road, the five-story, 100-room hotel will be the first Mr. C hotel to debut in the southeastern United States. The family famously owned the Belmond Cipriani Hotel in Venice, Italy, until the 1960s and operates Mr. C in Beverly Hills and Mr. C Seaport in New York City, as well as other properties around the world. In Miami, it owns Cipriani Downtown Miami restaurant. The walls of the lobby at Mr. C Coconut Grove will feature gloss timber paneling. 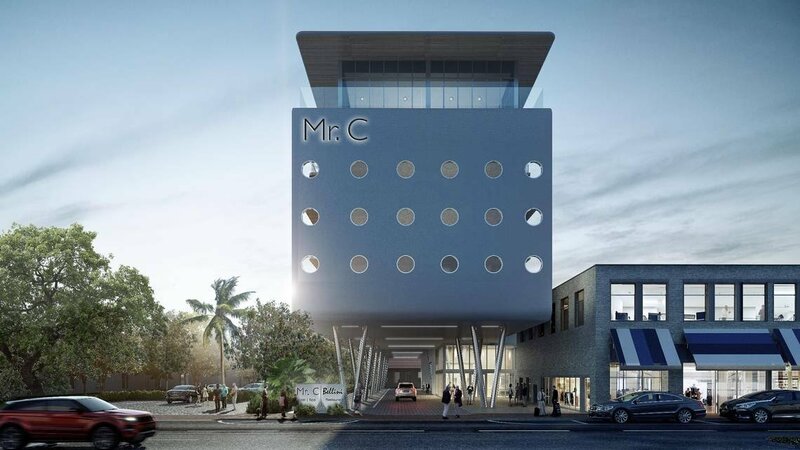 Designed by Miami firm Arquitectonica, Mr. C Coconut Grove will combine the European with the nautical. The interiors are designed to be reminiscent of a classic yacht, with glossy timber paneling on the lobby walls; terrazzo floors; glass chandeliers and blue, white and pink furniture. The facade of the building resembles rows of portholes. “This design embraces the idea of the historic Stiltsville structures in Biscayne Bay that can be seen at a distance from the rooms and public spaces of the hotel,” Raymond Fort, senior associate of Arquitectonica, said in a release. Rendering of a guestroom in the 100-room Mr. C Coconut Grove. 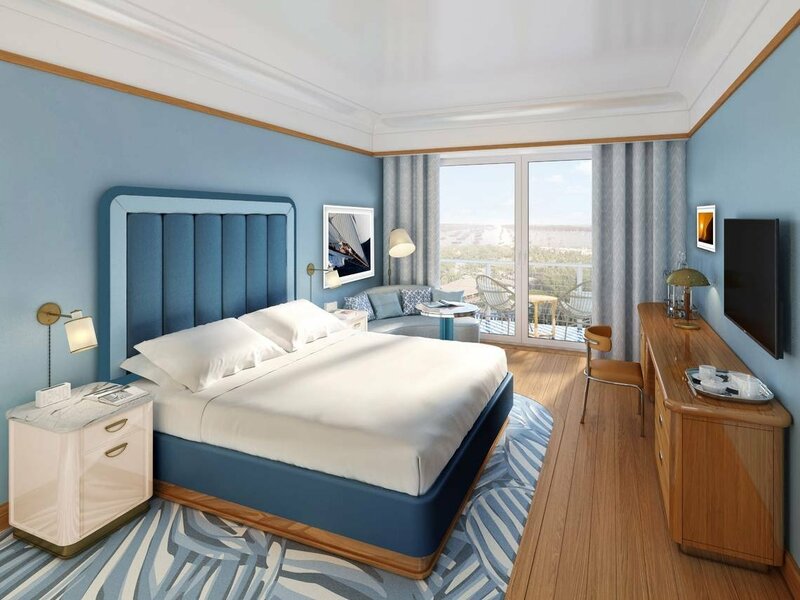 Guestrooms and suites will all have outdoor terraces and teak-paneled foyers with nautical decor. For meetings, a top-floor ballroom will have panoramic views of Biscayne Bay and room for 150 seated guests, and a ground floor covered space has room for 720. Other features include a gym with personal trainer and yoga classes, a lobby lounge, a rooftop pool, and a private spa, sauna and treatment room on the pool deck. Also on the rooftop will be a new Italian dining concept called Bellini Restaurant and Bar, inspired by fourth-generation owners Ignazio and Maggio Cipriani's Italian travels. Menu items will include the Mr. C club sandwich, and Italian dishes such as Mozzarella in Carrozza, a type of fried cheese sandwich, Tagliatelle con Zafferano e Pancetta, a pasta, and Grigliata Mista di Pesce, or grilled mixed fish. “We are extremely excited to be part of the revitalization of such a wonderful neighborhood, known for its iconic history,” said Ignazio Cipriani, founder and president of Mr. C Hotels. The view of Biscayne Bay from the conference rooms at the new Mr. C Coconut Grove hotel. Coconut Grove is undergoing a facelift, with several condo projects and the redesign of CocoWalk into a modern open plaza with high-end retail and office space. An Aloft hotel is also planned for the neighborhood, according to the Real Deal. “The hotel complements the rest of the mixed-use block that is part of the development, where there are restaurants, shops and shared office space,” said Harold Fort, planner and developer of Main Highway Partners, which will develop and own the property. “We feel that Mr. C Coconut Grove will become the meeting place for the community and visitors alike. Rooms at Mr. C Coconut Grove will start at $325 for the standard category, a superior king.